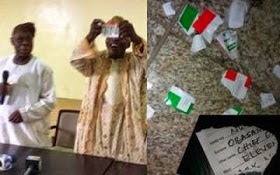 Yesterday, former president Olusegun Obasanjo shocked Nigerians when he publicly shredded his PDP membership card. A video of him in the act with more details of what really happened is out and it's a must-see. Leaders of the PDP from Obasanjo's ward around his former residence in Ita Eko, where he registered, had visited the ex-president to express their concern with his recent utterances against the government of President Goodluck Jonathan and what he considered as the President's role in the postponement of the general elections from February to March. Obasanjo had alleged on Saturday that Jonathan had a "grand plan" to scuttle democracy in the country through the poll shift, accusing the President of trying to win the presidential poll "through hook or crook." The guests in Abeokuta had told the former Head of State that they had come to plead with him to stop his criticisms of the incumbent president. They also informed him of the feelers that they were getting that the leaders of the party were planning to expel him from the party. PUNCH reports Obasanjo asked his guests if they were with their PDP membership card, which some of them produced. He subsequently asked for his own, which someone brought to him. He then directed the leader of the team to tear the card in shreds, telling the visitors that he was no longer a member of the ruling party. The former president had last year resigned his membership of the party, when he was the Chairman of the party's Board of Trustees, arguing that he could no longer be in the same party and be led in the South-West by someone he referred to as a confirmed drug baron. Na wa o. So where Obasanjo dey when Naija dey spoil abi him just wan enter APC cos him feel say them go win? Make we dey look.